Kevin Johnson sexual assault allegations: Sacramento mayor faces questions. 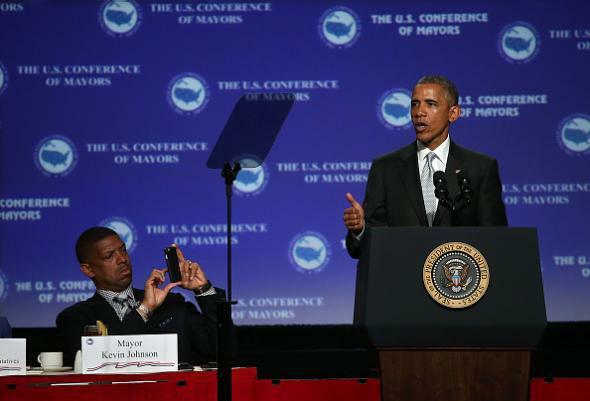 Sacramento mayor Kevin Johnson and President Obama at the United States Conference of Mayors on May 19 in Sacramento. ESPN will delay the broadcast of a documentary about the Sacramento Kings because of renewed reporting on a sexual assault allegation against one of the film’s subjects, former NBA star and Sacramento mayor Kevin Johnson, Sports Illustrated reports. The inspector general who made the allegations, a Bush appointee and member of the conservative Federalist Society named Gerald Walpin, was fired by the Obama administration in 2009 in a controversial move questioned by members of both parties. Walpin’s termination was ultimately the subject of a critical Congressional report, issued by Republicans Charles Grassley and Darrell Issa, that made reference to the allegations against Johnson, who has implied that some of the accusations against him are politically motivated. Mayor Johnson chose to come back to his hometown of Sacramento to make a difference and he is proud of his role in working with local leaders and residents to achieve so many successes. From the day he entered the 2008 campaign, Mayor Johnson has been the target of endless attacks from those desperately trying to preserve the status quo and putting their interests ahead of Sacramentans. Despite these efforts to rehash and repackage baseless claims, Mayor Johnson has and will remain focused on his mission since day one - making Sacramento a city that works for everyone. It’s not clear what will ultimately happen to ESPN’s Down in the Valley, a film about the successful campaign to keep the NBA’s Kings franchise in Sacramento that reportedly portrays Johnson in a very positive light. ESPN’s statement on the delayed premiere said the move is intended to “make sure it’s clear that we are not tone deaf and we’re aware of a renewed focus on certain issues,” and Sports Illustrated says additional interviews and material could be added before the film is broadcast. A Sacramento screening of the film, however, is going forward as planned tonight.